The fall armyworm is a destructive moth that causes devastating damage to almost 100 plant species, including sorghum, rice, wheat and sugarcane, as well as a variety of horticultural crops, thereby threatening food and nutritional security, trade, household incomes and overall economies. The fall armyworm spreads very fast – in its adult stage it can move over 100 kilometres in a single night. The pest is also capable of laying hundreds of eggs, with the emerging larvae burrowing into crops, destroying and eventually killing the plants. Until 2016, the fall armyworm was constrained to its native region of origin, the Western Hemisphere (from the United States of America to Argentina). However, in January 2016, the pest was reported in Nigeria and it has since spread at an alarming rate across Africa; its presence has been confirmed in more than 28 African countries, while a further nine either strongly suspect, or are awaiting confirmation of invasion. Already, in less than two years, the impact of the fall armyworm is being felt across Africa. Estimates from 12 African countries indicate that the pest is causing annual maize losses of between 8 – 21 million tonnes, leading to monetary losses of up to US$ 6.1 billion, while affecting over 300 million people in Africa, who, directly or indirectly, depend on the crop for food and well-being. The pest’s impact is likely to be even higher when its damage on other crops is quantified. This new menace piles onto a range of existing challenges afflicting Africa. For instance, many regions of the continent are already experiencing the impacts of climate-change, including drier and hotter weather, stressed out soils, various invasive pests such as Tuta absoluta, and increased outbreaks of existing pests such as stemborers and the parasitic Striga weed, leading to enhanced threats to agriculture and health. “Efforts to control the fall armyworm through conventional methods, such as use of insecticides is complicated by the fact that the adult stage of the pest is most active at night, and the infestation is only detected after damage has been caused to the crop. The pest also has a diverse range of alternative host plants that enables its populations to persist and spread. Moreover, fall armyworm has been shown to develop resistance to some insecticides, while the performance of such chemicals is also hindered by limited knowledge and purchasing power of farmers, resulting into use of low quality, and often harmful products,” notes icipe scientist, Dr Charles Midega. A recent study has established that a climate-adapted version of Push-Pull, an already widely used technology developed by icipe and partners is effective in controlling the fall armyworm, providing a suitable, accessible, environmentally friendly and cost-effective strategy for management of the pest. These findings represent the first documented report of a readily available technology that can be immediately deployed in different parts of Africa to efficiently manage the fall armyworm. Push-Pull, an innovative companion cropping technology developed over the past 20 years by icipe in close collaboration with national partners in eastern Africa and Rothamsted Research, United Kingdom, is modelled along the African smallholder farming system of multiple cropping. Originally developed for the control of stemborers, the key pests of cereal crops across most of Africa, and the parasitic Striga weeds, Push-Pull involves intercropping cereal crops with insect repellent legumes in the Desmodium genus, and planting an attractive forage plant such as Napier grass as a border around this intercrop. The intercrop emits a blend of compounds that repel (‘push’) away stemborer moths, while the border plants emit semiochemicals that are attractive (‘pull’) to the pests. Push-Pull has recently been adapted to drier areas through the incorporation of drought tolerant companion plants: Greenleaf Desmodium as an intercrop and Brachiaria cv Mulato as a border crop. In addition, Push-Pull also controls maize ear rots and mycotoxins, while improving soil health and providing high quality fodder, since the companion crops are superior forages. Therefore, the technology facilitates crop-livestock integration thus expanding farmers’ income streams. “Over the past several months we received information from Push-Pull farmers that their fields were free of fall armyworm infestation while neighbouring monocrop plots were being ravaged by the pest. Therefore, we evaluated the climate-adapted version of the technology as a potential management tool for fall armyworm in Kenya, Uganda and Tanzania,” explains Prof. Zeyaur Khan, Push-Pull leader at icipe. The study revealed fall armyworm infestation to be more than 80% lower in plots where the climate-adapted Push-Pull is being used, with associated increases in grain yields, in comparison to monocrop plots. The findings were supported by farmers’ perceptions through their own observations regarding significantly reduced presence of fall armyworm in Push-Pull plots. “The ability to manage such a devastating pest clearly demonstrates Push-Pull’s utility as a platform technology in addressing the multitude of challenges that affect cereal-livestock farming systems in Africa. icipe intends to continue disseminating the technology as widely as possible across Africa, while advancing studies to understand the scientific basis of its effectiveness against the fall army worm,” says icipe Director General, Dr Segenet Kelemu. Dr Kelemu further acknowledges the long term and dedicated investment by various donors including: the European Union; Biovision Foundation for Ecological Development, Switzerland; UK’s Department for International Development (DFID); Swedish International Development Cooperation Agency (SIDA); the Swiss Agency for Development and Cooperation (SDC); the Kenyan Government, and several others, in the development and implementation of Push-Pull, as a clear example that investment in research for development pays and generates high value for money. icipe’s mission is to help alleviate poverty, ensure food security, and improve the overall health status of peoples of the tropics, by developing and extending management tools and strategies for harmful and useful arthropods, while preserving the natural resource base through research and capacity building. The Push-Pull technology involves intercropping cereals with a pest repellent plant, such as Desmodium, which drives away or deters stemborers from the target food crop. 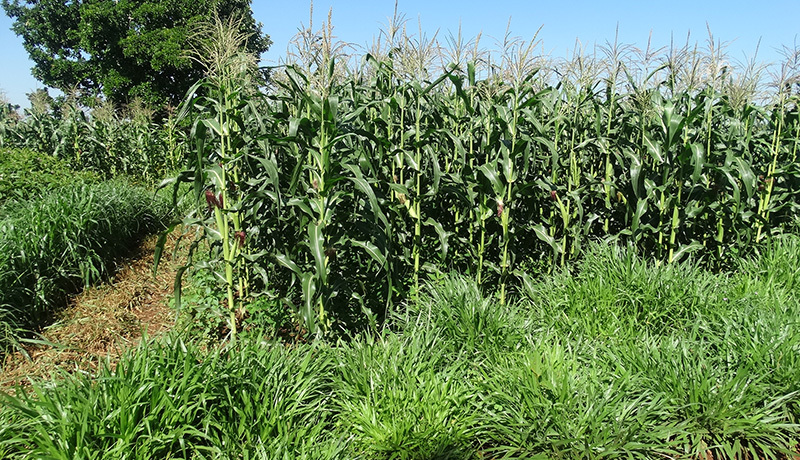 An attractant trap plant, for instance, Napier grass (Pennisetum purpureum), is planted around the border of this intercrop, to attract and trap the pests. As a result, the food crop is protected from the pests. In addition, Desmodium (D. uncinatum or D. intortum) stimulates suicidal germination of Striga and inhibits its attachment to the roots of cereal crops by hindering growth of its haustorium. Moreover, Desmodium improves soil nitrogen, phosphorous, carbon and biodiversity. The technology has also been noted to reduce aflatoxin contamination, and more recently, the fall armyworm that has invaded several African countries. Push–Pull also has significant benefits for dairy farming, since Desmodium and Napier or Brachiaria grass are high quality animal fodder plants. Therefore, Push-Pull improves household nutrition, incomes and overall livelihoods. Financial support for this research was provided to icipe by: European Union; Biovision Foundation for Ecological Development, Switzerland; UK’s Department for International Development (DFID); Swedish International Development Cooperation Agency; the Swiss Agency for Development and Cooperation (SDC); and the Kenyan Government. The views expressed herein do not necessarily reflect the official opinion of these donors. Collaborators: The studies were conducted in collaboration with Rothamsted Research, UK, which receives grant-aided support from the Biotechnology and Biological Sciences Research Council (BBSRC), UK, with additional funding provided under the Biological Interactions in the Root Environment (BIRE) initiative.